Your key to better results In Organic Google Search Results. 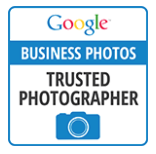 Look For The Sign Of The Google Business View Badge - So You Can Hire Your CERTIFIED PRO TODAY! Google teamed with Vu Studios 360-V-TOURS to bring you Business View. We shoot a Google Street View style virtual tour walkthrough inside your business and place it right in Google Search Results, Maps and Places. This will significantly enhance your organic results from Google and your bottom line. It is the perfect compliment to our website tours. Add a virtual tour - Bring your business to life: create a 360-degree, interactive tour. Showcase all the details that your customers love. Perfect for restaurants, retail shops, gyms, salons, and more! Engage your customers - With Business View, your customers can enjoy a virtual walk around, explore, and interact with your business like never before, from anywhere in the world. Customers will be able to truly experience your business - just like being there! Share with the world - These images appear in Google searches, Google Maps, and Google+ Local, now you can easily embed panoramic photos on your own website, social media pages, and more!